Dembede Mido better known as Checkmate Mido is a poet and performer. 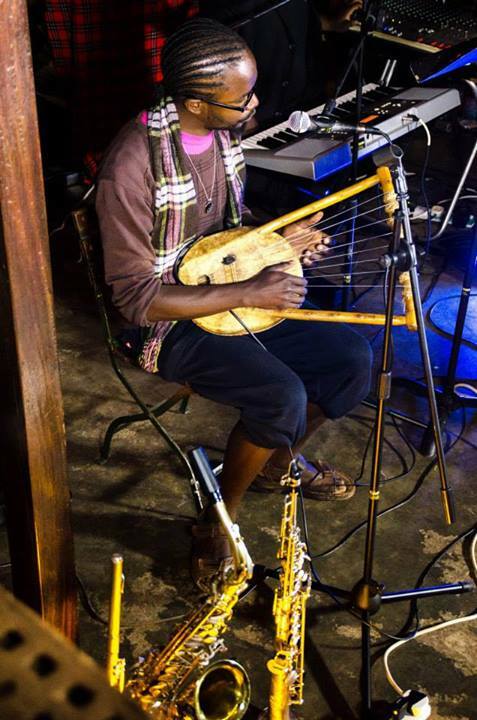 He recently collaborated with Ogutu Muraya at the Nu Vo Arts Festival, accompanying him on the nyatiti and chivoti. Checkmate Mido playing the nyatiti. Photo courtesy of NuVo Arts Festival. CM: Checkmate is my poetry name. It’s my poetry alter ego, if you may;my poetry mind, my poetic side. I don’t know how to express it but Checkmate is like the person who makes me who I am. Mido is me. It is the mind. So Checkmate Mido is one person. SA: Has Checkmate Mido been out and about tonight? CM: I’ve been to to NuVo Arts Festival and it has been brilliant so far. It has been exciting because we checked into Kampala at 5:00am this morning and were fortunate enough- with my friend Ogutu from Kenya, to take a walk around town. What was in everybody’s mind was the arts in Uganda, especially the poetry. What I first wanted to check out was what the poetry in Uganda is all about, and what people are talking about. What I saw today on stage was phenomenal, if that’s what the poetry in Uganda is all about, I’ll try in the next four to five days to see what connections we can make with these artists. So far it has been an exciting and fruitful experience. SA: In terms of collaboration in a more integrated East Africa, what do you think the platforms like NuVo can achieve? What do you imagine might come out of this? CM: I’m hoping that, at least from my experience today and walking around, there shall be much more appreciation for the growth and energy around here. Artists in Kenya and especially in Nairobi, and specifically me even don’t know about it. I was only introduced to Kemi through a script workshop that happened in New York and then we were reading a few scripts. It seemed like a chance meeting, like a by-the-way, connections are something that we should be consciously aware of; that across the borders, there are our neighbours who are doing amazing stuff. That there are people in Tanzania doing amazing stuff. I think this is the first step at bringing all these diverse people together because I’m from Kenya, Oguti here is from Kenya, and just from that sharing we get to connect with other people. We can connect with different audiences and different people in ways that resonate our piece with them. This is a platform that has the potential to bring together all these creative minds from different places not just Uganda but from everywhere. SA: When did you get to be a part of NuVo? CM: I got to know about NuVo about a month ago. It was just from a tweet because I follow Kemi (Kemiyondo Coutinho) on Twitter and she tweeted about the festival and I followed it up. From there it has just been a process leading up to me being here. I wouldn’t say that I’ve known about it for so long. SA: I see that you play some traditional instruments, what are they? CM: I play the nyatiti which you just heard. I play the chivoti which is an African flute. It is a flute made from bamboo. I also play the jjembe, which is a West African drum. I’m also good at a couple of East African drums. SA: From which community do you come from? These instruments are obviously from various parts of Africa. Are they adopted or are they a part of your heritage? CM: Actually all the instruments that I play are adopted. The only instrument I play which is from my nation is the isukuti which is the Luhya drum. It is made with goat skin that has stretched over a wooden frame that is almost cylindrical. I don’t necessarily choose to play instruments from my community. If it sounds nice to my ears then I’ll pick it up and learn it. That is only if it connects to me in a particular way. The nyatiti connected with me in special way and when I play it, I feel it’s energy coming out. That is how I pick whichever instruments I want to play. SA: Have traditional African instruments been part of your repertoire or something that you’ve acquired recently? CM: It’s something that I’ve acquired recently. SA: Do you have musicians in your family? CM: That’s a difficult question. For me, I come from a family where the family history wasn’t shared fully. I don’t even know what my name means, yet I know that it must have a meaning because no one is given a name that has no meaning. When we ask, either our parents don’t say it or they have no idea what the name means because there has been this disconnect between the past and the present. We might want to blame it on the British for coming and colonising us, giving us all these buildings and cars and phones, but I think it starts with us. The moment we decide to forget who we, and all the things that make us, that’s when we get the disconnect between the past and the future. It is the reason why I’m unable to know whether my great-great-great granny was a musician or not. I feel that I am being guided by people who preceded me, and people who are in my family right now. When I’m on stage, I feel like there was someone in our family who was a musician. I just know it because I feel it. SA: Like you are in the footsteps of someone who has been here before you? CM: Yes, that’s right. It feels right. SA: When did you get into poetry and performance with instruments? CM: Since way-way back. I’ve been actively performing since 2007-2008, but before that I was in high school and just writing, not performing as much as I do now. SA: How old are you now? CM: I’m 24, but I’ve got the mind of a 40 year old. SA: They say age is just a number. CM: And it’s in the head. SA: Are you a published poet? CM: I can’t say I’m published, I haven’t published any of my material. I have just shared it on stage, online, through blogs and though particular print media. If I’m published then I can’t say it because I don’t know about it. So far I can’t say that I’m a published poet. SA: You mentioned something really interesting, it is an abstract affliction which many of us in the modern times are faced with in the sense that we have all this modern technology from the west and local expertise. We live in between so many cultures and this is either explained by displacement from our villages, our places of birth, or we’ve been born in the Diaspora or we are in relationships with people who are not from our communities. Do you think that your experience as a boy growing up in the city and also being faced with your past has led you to reappropriate cultures that may be lost? CM: Yes. I’d say that is true. I can’t find the right words but like you say, I am a city boy who is 24 years old, yet I’m also a man who mentally pictures himself as a kid. This is because I know so little about where I am from. Whether it is through my name or the title associated with me; the son of so-and-so who belongs to so-and-so community, the truth of the matter goes deeper than that. There is a guiding force and no matter how much we ignore it, it shall always be there and we shall always feel that it is there. What I think I try to project my past onto my music, and the reason why I play my instruments is to share my expressions. Not to preach to anyone, but to tell them that look here, we are missing out on something due to a disconnect that happened at a particular point in our generation or in the previous generation. The past and the present create the future. Therefore at the moment we disconnect the past from our future, the present is just left to adamantly follow whatever is trending. SA: Despite there being many disconnections, do you think that there are any ways to popularise indigenous native cultures? Do you see any signs of revival? CM: I don’t know. I can’t pin point anything and declare that there are signs and no signs. What I can recall though is a brief show that we did recently on Saturday 29th June before we took our bus to Kampala. I was with Ogutu in Ngong, where we did a campsite show at a camp that is actually based on Maasai land. The show itself was based on the stories behind the names of most things in Kenya. Most of the names in Kenya were Maasai, but when the British came, various place names were Englishified such as Longonot which was Olon Ngot, Mt. Kenya which was Oldo lnekai. So because they could not pronounce the Maasai names, they changed most of the names to make it easy on their tongues, and that is one example of how the disconnect came about. What we are trying to do is to bring people back. We are sharing the original stories of these places and giving insight into why Maasai land was popular back then. After the show people were so excited and they were saying this is what we need. It is as if people have this hunger to know what the past was like, and what the past contained, but they do not have the sources. I believe artists are the key to that past because they communicate these messages to a society that is hungry for knowledge. It is up to the artists to deliver that message and give it to people in a positive and reflective way.